When it comes to adapting, we Kiwis are experts. Our ‘Number 8 wire’ attitude sees us modify, improve and invent products out of necessity, or just to ‘make do’. 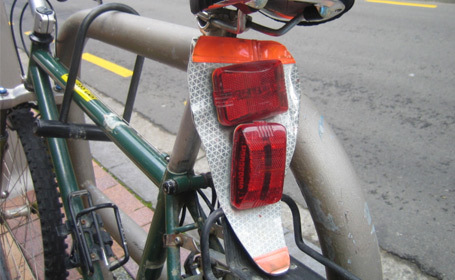 This Wellington cyclist shows Kiwis are not afraid of some prototyping to find a solution, and stay safe on the road. Businesses wanting to survive in times of change can learn from how people behave and adapt to and interact with their environment. Which coping strategies do people employ when a product is not up to the job intended? How could the product be improved to provide a more rewarding experience for the user? Do customer’s habits reveal a latent need for a new product to serve emerging behaviours? Observing customer behaviour in the context of use, getting out there amongst your customers, building empathy with their needs and watching for these habits is an insightful way to answer these questions …and a core user research technique. …but if you are a bicycle accessories company, this may find you hanging out behind the bike shed after dark. …hmm. This entry was posted in Behaviours, Empathy, Insights, New Zealand, Number 8 wire, Observations, User research by Nick. Before you read this: it is ironic for I had to re-post this, due to my poor grammar. I have a cute little tale to share. Some time ago I worked for a large American Corporation. We were designing a system that enabled management of fault resolution across an ATM network. The system had a number of user groups. These included some very important people from the banks, interested in how their network was performing as a whole, as well as the status of individual faults on an ATM by ATM basis. For this they would take a peek at the incident notes. These notes were primarily added by the engineer servicing the ATM and the staff in a call centre managing the resolution of the incident using the telephone and this system. We did an immense amount of user research for this project. I recall being both amused and impressed by one team leader within a call centre in which I was observing. Engineers and call center staff were evidently guilty of making comments exhibiting notable spelling errors and slang (which of course the super important people in the bank were certain to see). This did not impress their boss. So what did she do? She had them copy their comments out into Word, spell check, and re-paste these back into the system. Precious seconds lost, but reputation retained. What did we do? We imposed an auto spell check within fields of course! Precious seconds gained, reputation enhanced. Thoughtless Acts by Jane Fulton Suri (IDEO) is a fabulous picture (yes picture) book on collating her snaps of the coping mechanisms like these employed by we creative humans. You should check this out!